VEDA’s Shenandoah Valley delegation is proud to be hosting the 2019 Spring Conference March 27-29. Please mark your calendars and plan to join us at the beautiful Hotel Madison & Shenandoah Valley Conference Center in downtown Harrisonburg. We have a lot of catching-up to do since the weather forced us to cancel the Fall Conference. Our Planning Team is putting the finishing touches on a great agenda filled with excellent speakers and fun networking opportunities. The Spring Conference theme is Your Place – Your Story. Kate McEnroe and Audrey Taylor, well-known and widely-respected site selection consultants, will lead a panel discussion on utilizing Familiarization (FAM) Tours to communicate your story and build relationships. Ben Muldrow will lead a session on Effectively Branding Your Community. Our Lynchburg colleagues will lead a case study discussion of how this innovative city implemented a series of creative placemaking strategies. Author Melody Warnick will get us started on the right foot with Thursday’s Keynote Address This is Where You Belong – Finding Home Wherever You Are. Be sure to keep Thursday evening open – we have an exciting time planned for you downtown in the ‘Burg! The VEDA Spring Conference continues an expanded format to bring you more learning and networking opportunities. Pre-conference activities (Golf, Cycling, and a Downtown Walking Tour) will be offered on Wednesday, March 27th. VEDA’s Professional Development Workshop will be held on Thursday, March 28th from 10-12 at Harrisonburg City Hall. The conference will kick-off with a luncheon and keynote speaker and author, Melody Warnick and will conclude on Friday, March 29th, following lunch and a panel discussion on Virginia’s biggest project to date and how HQ2 in Northern Virginia will impact all of the Commonwealth’s economic development efforts. Online Conference Registration closes Thursday, March 21, 2019 at 5:00 pm. No cancellations or refunds after Thursday, March 21, 2019. Cancellations made prior to Thursday, March 21, 2019 will be assessed a $25 processing fee. Harrisonburg has a vibrant biking culture with a wide variety of rides and routes to satisfy all skill levels. Members of the Shenandoah Valley Bicycle Coalition will lead VEDA participants on a ride that matches their skill level and desired route. Exact itineraries to be determined by the group. Date/Time: Wednesday, March 27, 2019; Biking Begins at 1:30 pm. Cost: There is no cost to participate in this event, but registration is required by March 21st. Participants may supply their own bicycle or rent one at the designated area. Bottled water and light snacks will be available. Shenandoah Bicycle Co offers rentals. Limited parking is available in front of the shop off S Main St. More parking can be found behind the shop in the city parking deck between Water Street and Bruce Street. Harrisonburg Downtown Renaissance, the City’s Main Street Program, will guide VEDA participants on a walking tour of Harrisonburg’s award-winning downtown. Starting from the Hotel Madison lobby, participants will see attractions, mixed-use developments, unique retailers, restaurants, breweries, and more! Pack your walking shoes and come see why Harrisonburg was awarded a National Main Street Community! Cost: There is no cost to attend the Downtown Walking Tour, but registration is required by March 21st. Logistics/Additional Information: Walking Tour participants should meet in lobby of the Hotel Madison by 3:45 and the group will depart fromthe Hotel Madison promptly at 4:00 pm. VEDA is pleased to have site location consultants Kate McEnroe and Audrey Taylor as speakers on the Spring Conference Agenda. To effectively use their time with us, VEDA is offering 20-minute sessions on Thursday, March 28th for VEDA members to speak with them. The cost for this opportunity is $150 and will help defray their speaking fees. This is open to VEDA members only, on a first-come, first-served basis. One session per organization please. Sign up as part of your conference registration. If you have a preference of who you would like to meet with, please list it with your choice of time and we will do our best to accommodate. On Thursday, March 28th and Friday, March 29th, VEDA Spring Conference participants will have the opportunity to have their professional photograph taken. You might spend upwards of $150 to have your professional head shot made in a studio. VEDA is offering this opportunity to conference participants for $25 to cover the cost of the photographer. Three to four photos will be taken of each person and sent to you digitally following the conference. VEDA will have a sign-up sheet at the registration desk to select the time to have your photo taken. Reserve your spot today through the conference registration process. All you need to do after that is look your best and smile for the camera! The networking and fun will continue at Ruby’s Arcade in downtown Harrisonburg, just a short walk from the hotel. VEDA has reserved the whole place for extended fun, food, and drink. Ruby’s Arcade features GAMES! GAMES! GAMES! including Duck Pin Bowling, Foosball, Pool, Arcade Games, Darts, Shuffleboard, Air Hockey, Ping Pong and More! Dress: Casual! Shuttle service may be provided or take a 10-minute walk to 100B 165 S Main St, Harrisonburg. Entrance to Ruby’s Arcade is on Bruce Street side. If you’re new to VEDA, we want to extend our warmest welcome, learn more about you, and provide you with a thorough knowledge of the resources that are now yours as a VEDA member. Or if you’ve been a member for a while and just want to learn more and get involved, we hope to see you too! Join us for breakfast at 7:15 on Friday to learn about our history, goals, governance, and opportunities for you to engage in the organization. Located in Harrisonburg, Virginia in the gorgeous Shenandoah Valley, Hotel Madison & Shenandoah Valley Conference Center blends a sophisticated style with relaxing comfort. Featuring rooms with mountain and downtown views, a farm-to-table restaurant, and spacious ballrooms and boardrooms, Hotel Madison caters to the needs of the business, leisure and recreational traveler. 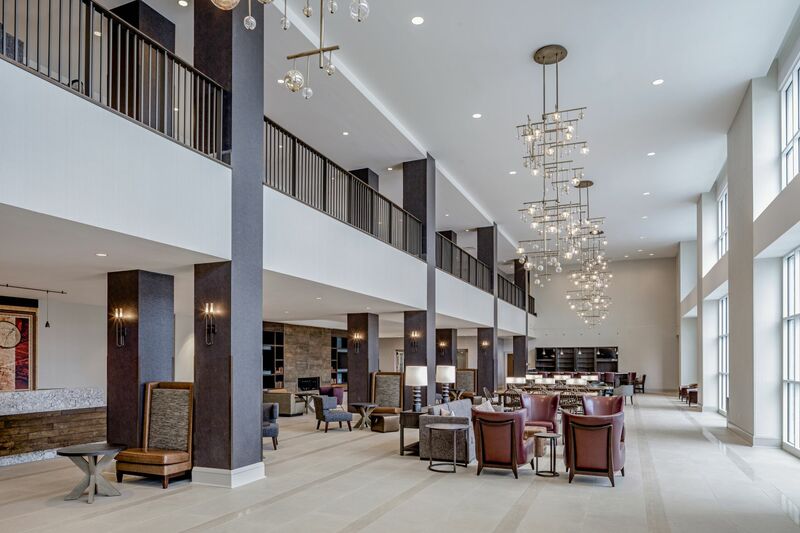 As the premier venue in the area , Hotel Madison invites you to surround yourself with top-notch facilities, exceptional services and the energy of the James Madison University campus and downtown Harrisonburg. Situated on the edge of the James Madison University campus and a five-minute walk to downtown Harrisonburg, the Madison Hotel is easily accessible from I-81 and the Shenandoah Valley Regional Airport. For reservations by phone call 540-564-0200 and indicate you are making reservations for the VEDA Spring Conference and the dates you will be staying at the hotel. To reserve your room at the VEDA Conference Rate of $139 make your reservation by Wednesday, February 27, 2019. Parking Hotel Madison has on-site garage parking for $5 per day, per car. Valet parking is also available for $10 per night.